PROTECT YOUR EQUIPMENT AGAINST RUST AND CORROSION DAMAGE. inhibitor you will ever need to work where you need it. Maintain the original appearance and performance of your equipment indefinitely with a minimum of cost and effort. Make your electrical systems virtually impervious to the effects of water for extended periods of time. TC-11 is a dielectric corrosion inhibitor. Loosen locked surfaces such as nuts and bolts with TC-11’s deep penetrating power. While there are a lot of products purporting to solve your rust and corrosion woes, the truth is, they simply don’t make good on their claims. Below are photos of identical steel Q-panels that were chemically cleaned, treated once with a competing product, and exposed to identical environmental conditions of 24-hours per day of a salt breeze, intermittent rainfall, tropical sunlight, and a nightly condensation cycle for 21 days. The panels were photographed on a daily basis to document the test results and the test can be duplicated by any interested party. 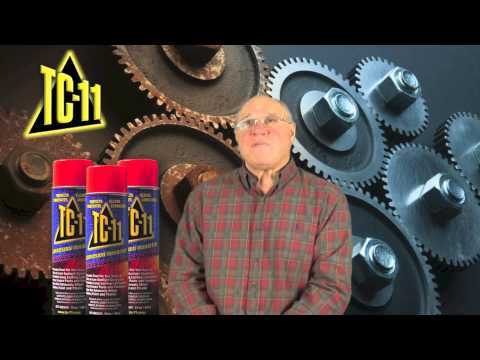 No other rust and corrosion inhibitor performs like TC-11. Whether you need to protect ordinary household items or heavy industrial equipment on land, at sea or in the air in the harshest of environments, you can count on TC-11. Order your supply today! TC-11′s proven performance is unmatched. Without a doubt, it will be your best friend for everyday use and for demanding applications in the toughest of environments. It beats its competitors in every way and its protective power lasts up to three times longer than its closest competitor making its per application cost 1/3 less. You won’t find a better value than tc-11.